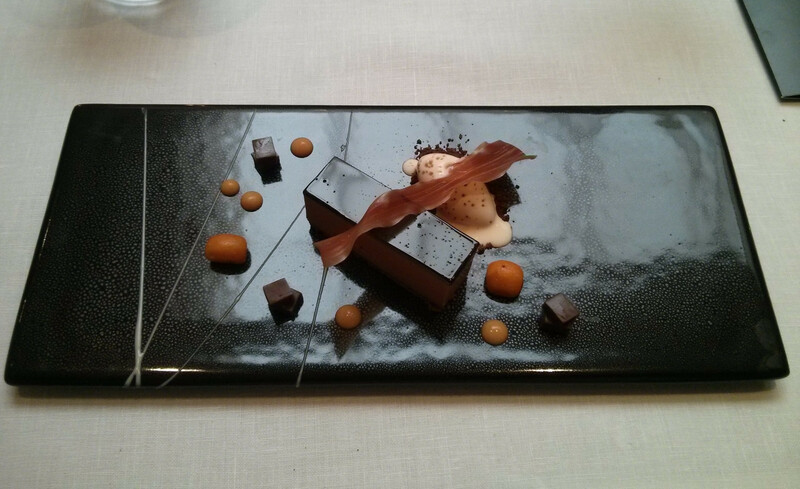 We recently enjoyed a lunch at Pied a Terre in Charlotte Street, Fitzrovia. As my wifes birthday fell on a Monday this year, it required a little more research to find somewhere open on Mondays. Luckily Pied a Terre, somewhere we have passed numerous times and have been meaning to visit, was not only open on Monday lunch time, but also had a 6 course tasting menu available for £49 a head. We started with a selection of canapes, with stand outs being a battered mussel, a salty crunchy delight of a bite, and a wonderful flavour rich celeriac panna cotta for my wife. We tried a few breads including an excellent brioche and ok baguette, but the star of the show was a treacle bread which was simply one of the best breads I've had in a long time, a perfect crisp crust with soft, chewy crumb with a definite hit of treacle. 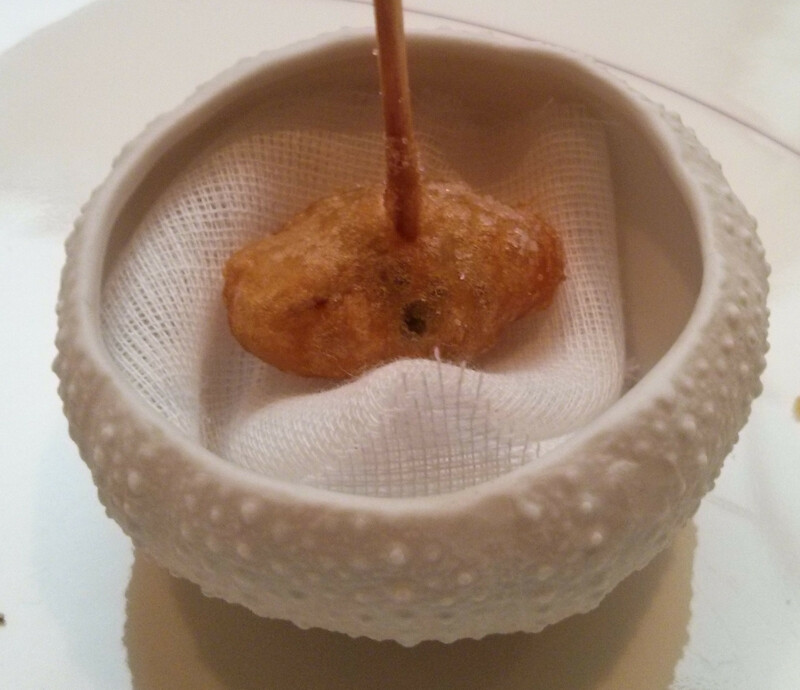 We both started with a chestnut and juniper gnocchi, a golden fried pillow with a brown caramelised surface and a generous slice of truffle on top. 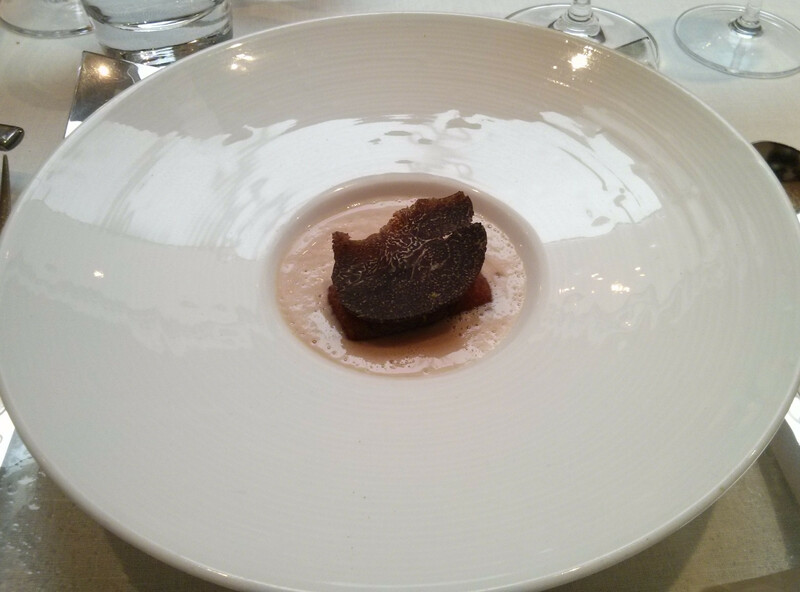 Into the bowl was poured a chestnut and truffle veloute. This was a fine start to the meal, with a deep truffle flavour in the smooth veloute. 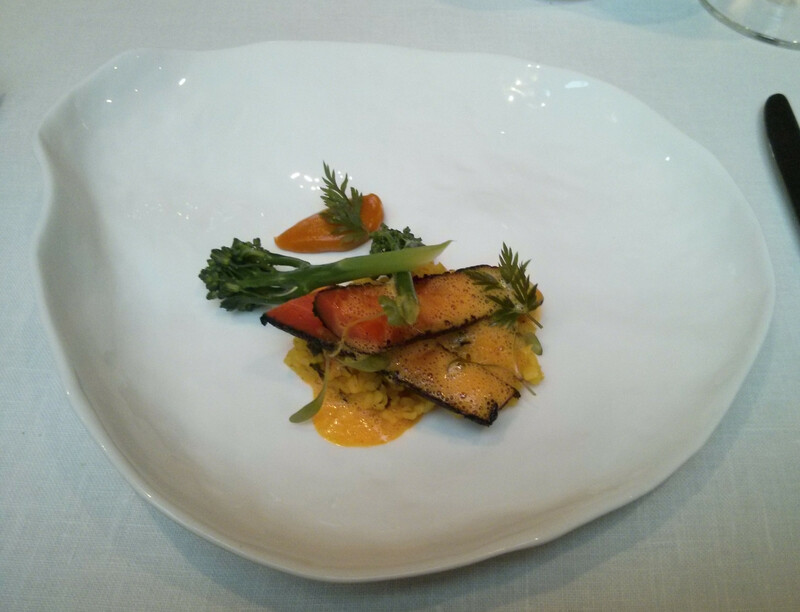 The next course was a carrot dish, the carrot coated with blackened spices and with accompanying vegetables, the spices were intense and well flavoured, a fine way to treat a humble carrot. I had a fantastic dish of cod with really lovely mussel sauce and some flavourful little new potatoes, the dish as delicious as it was pretty on the plate. 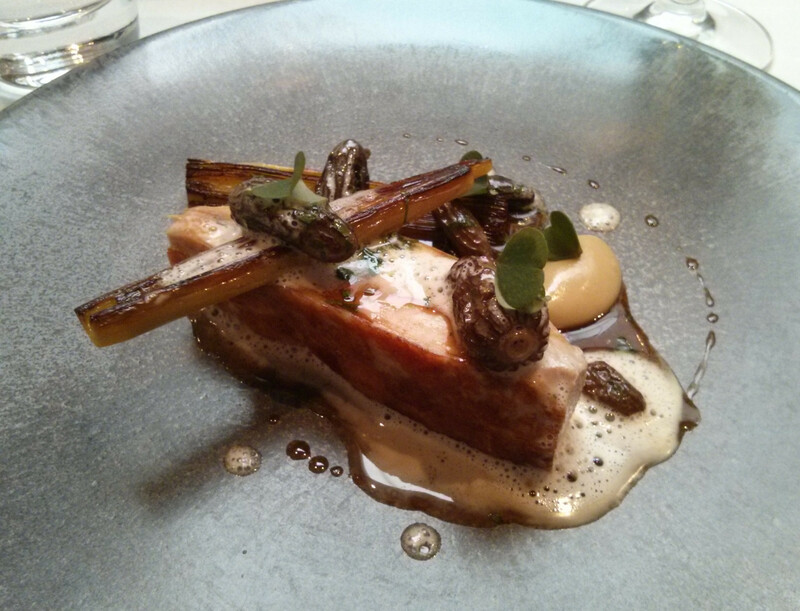 Our mains were both excellent, for me guinea fowl, morel mushrooms and shallot and liquorice puree. The guinea fowl had good flavour, a superior bird to chicken for me, but the morel mushrooms, my first of the year, were absolutely top class, some of the nicest I've ever had. 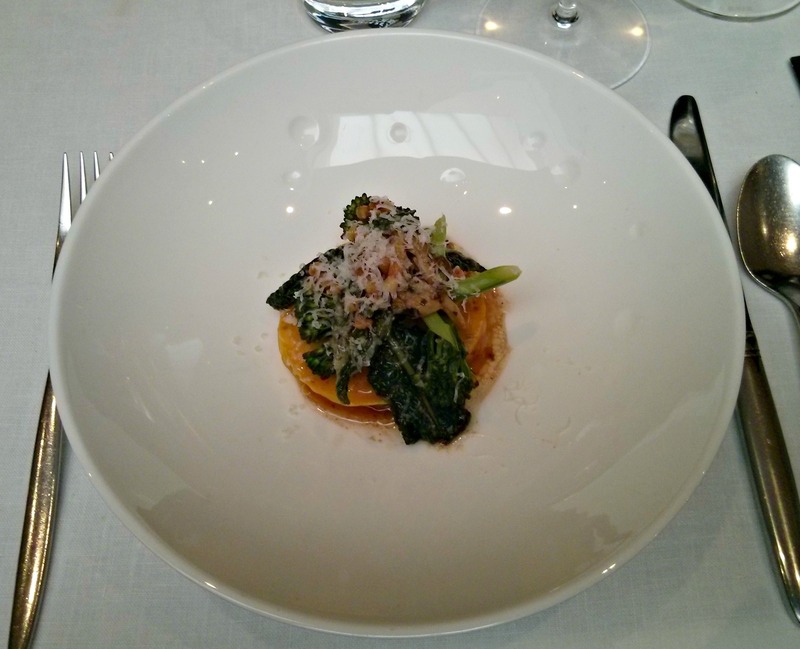 My wife had a onion squash ravioli, topped with cavelo nero and a pine nut butter. She really liked this dish, especially the textures added by the pine nuts. 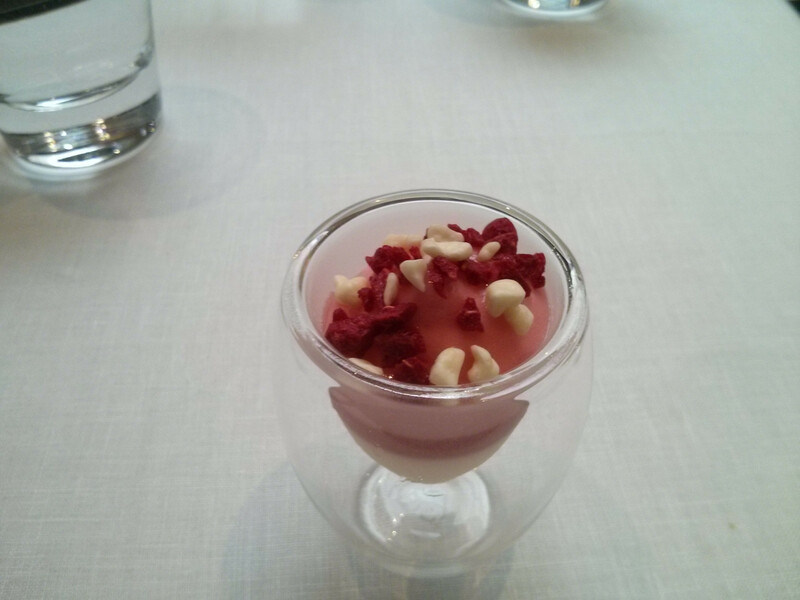 Pre-dessert was a glass with some lemon posset and orange mousse, a lovely little palate cleanser topped with some awesome white chocolate and freeze dried blood orange pieces on top, very nice indeed. Dessert proper show cased some very high end patisserie, a Valrhona chocolate creme, with dots of caramel sauce, cubes of chocolate jelly, some lovely peanut brittle pieces. The accompanying salted peanut ice cream was gorgeous, and the salty notes balanced against the sweetness of the chocolate perfectly. We had some nice wine to match, 2 glasses of rose champagne to start, a couple of excellent whites with the food, the 2 dessert wines recommended were really good. 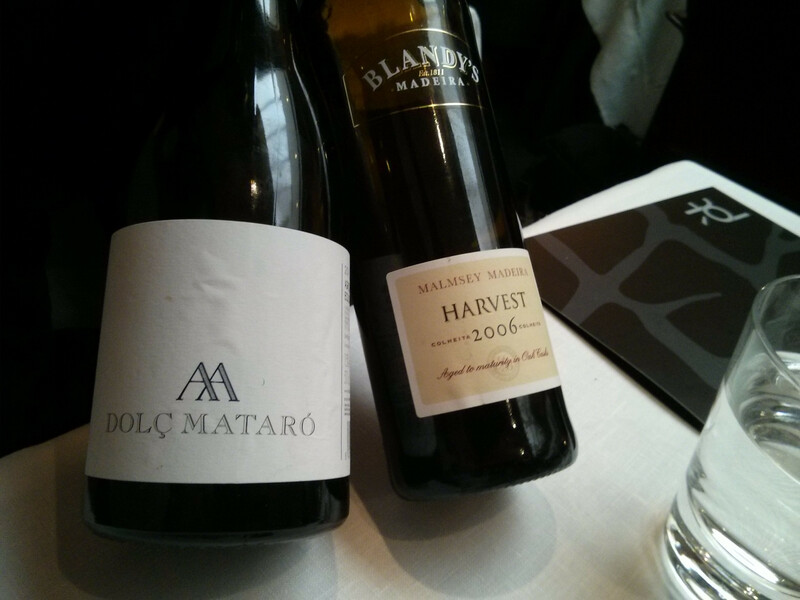 My Spanish red, a Dolc Mataro was unlike anything I've had before, sweet with many fruity notes, and just my type of drink. 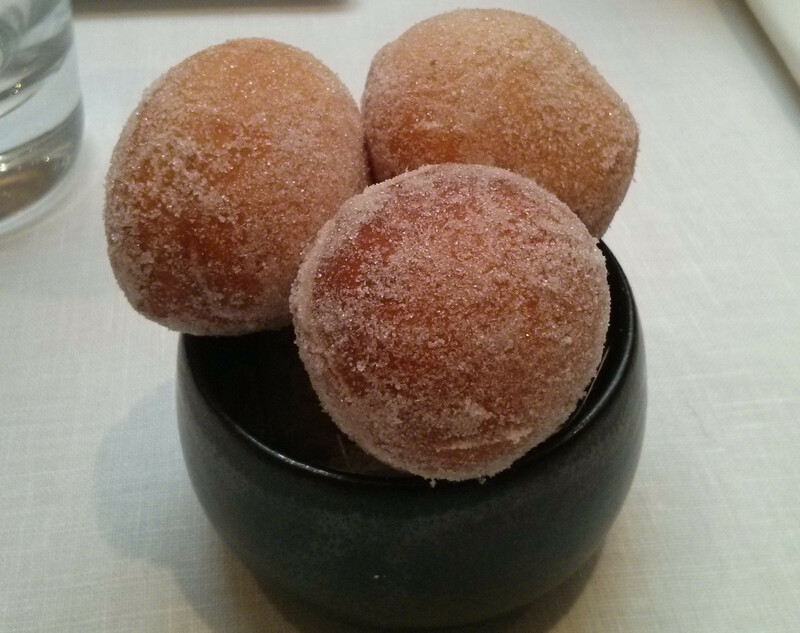 Petit four came with coffee, first up 3 on a dish, including a fantastic mandarin filled bowl, followed by some coconut ice cream truffles, and finally a bowl of hot doughnuts, each one as fluffy as a cloud, exceedingly fine examples of their kind. I was really impressed with Pied a Terre, not only was every aspect of the meal absolutely first rate, a tasting menu with an especially generous selection of goodies to accompany the coffee for £49 felt very good value. The restaurant team, with Marcus Eaves and his crew providing the best London's fine dining has to offer, with a really charming front of house to back them up. 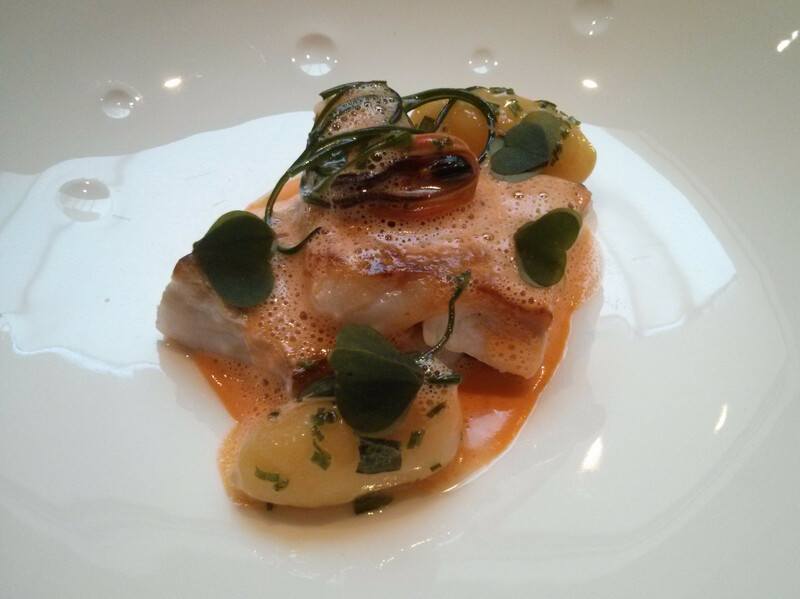 Cod with Poached Baby Potatoes, Fennel Puree and Cornish Mussels. Guinea Fowl with Morel Mushrooms, Braised Leek, Shallot and Liquorice Puree, Rosemary Jus. My brother was over for his annual trade expo in London, but as I had plenty of notice I managed to get a table at The Ledbury on a Friday night, no small feat. On Friday and Saturday you have a choice of 2 tasting menu's, and we opted for the one with an extra course with a few substitutions. We spent some time choosing a bottle of white, and the sommelier had it spot on with his selection, a demi-sec perfectly sweet enough for my taste, a Vouvray Le Mont, Domaine Huët from 2009. There was a good selection of bread, with a small seeded loaf placed on the table and a choice of breads from a basket, including their excellent bacon and onion brioche. Our first course was an artichoke and grape salad, with desiccated foie gras, a nice fresh start to the meal, with particulary nice Sauternes grapes. 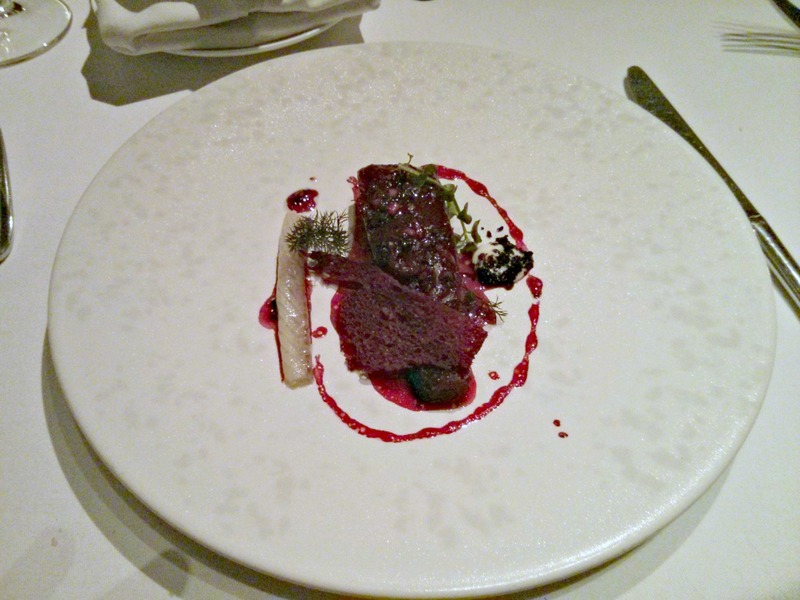 Next up, a really fine dish of baked crapaudine beetroot, beetroot crisp, black olives with a slither of smoked eel. Crapaudine are particularly fragrant beetroots with a delicate flavour, and were fantastic combined with the smokey rich eel. Following this was one of The Ledbury classics, flame torched mackerel with shiso, celtic mustard and cucumber. I love this dish, and was just as good as previously. We followed this with another classic, the buffalo curd and onion broth with the awesome bechamel and truffle cheese on toast. This is so good I really wanted my brother to try it and they were more than willing to substitute a quail egg and truffle dish for this so we could. The cheese on toast was fabulous, i could eat a whole plate of it alone, it's as perfect as anything could be. 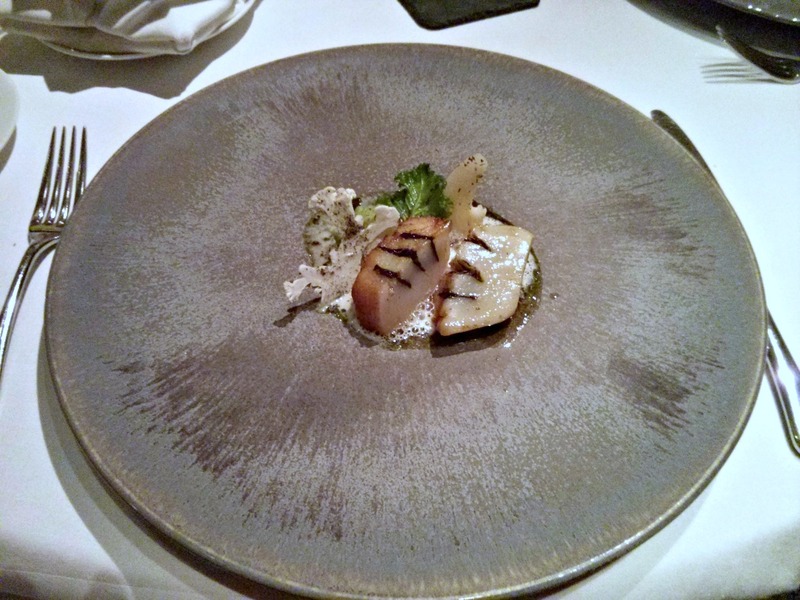 We followed this with a fantastic scallop dish, the scallop served with seaweed slices, cauliflower and a beautiful buttery foam. 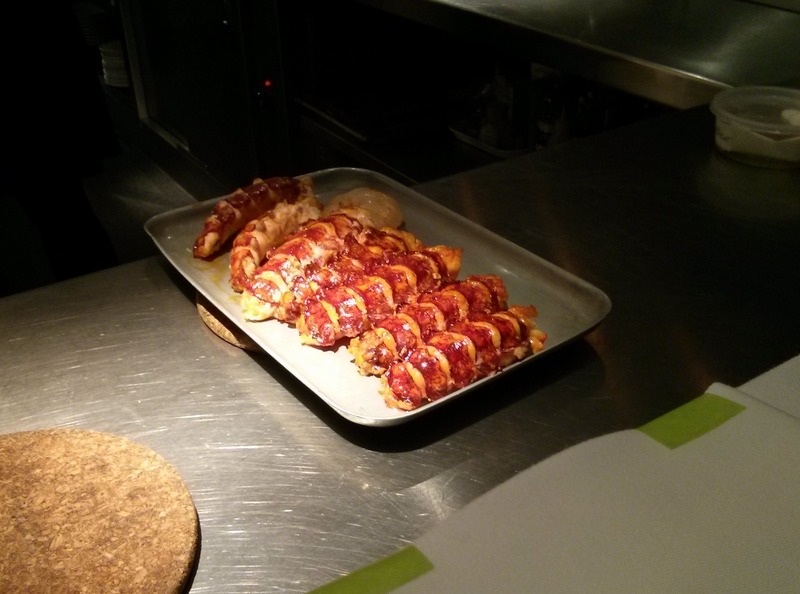 Soon after we were presented with the whole pork jowl, slow cooked for hour and finished with a selection of spices. When plated, the crackling was turned into a crumb and sprinkled on top of the pork and served with slices of apple and hazelnuts. The crackling and pork were a fabulous combination, soft, rich and unctuous. The best was saved until last, a fillet of beef, served with smoked bone marrow, crispy potato and salt baked ash covered celeriac. This was seriously good, every element in harmony and packed with flavour. My brother finished his off in seconds, and spent the rest of the time jealously eyeing up my plate, drooling and trying to persuade me to share the rest. Not a chance. 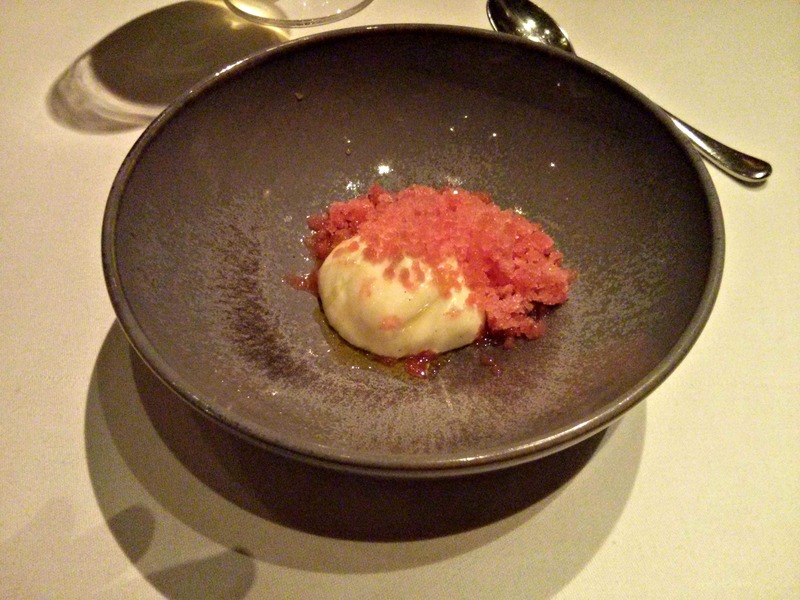 Pre-dessert was a blood orange granita and clove yoghurt, with the balance of clove just right as its an ingredient that can overpower so easily. Dessert itself was a replacement for the chocolate and banana tart, as my brother is avoiding gluten (yeah, yeah, yeah I know). 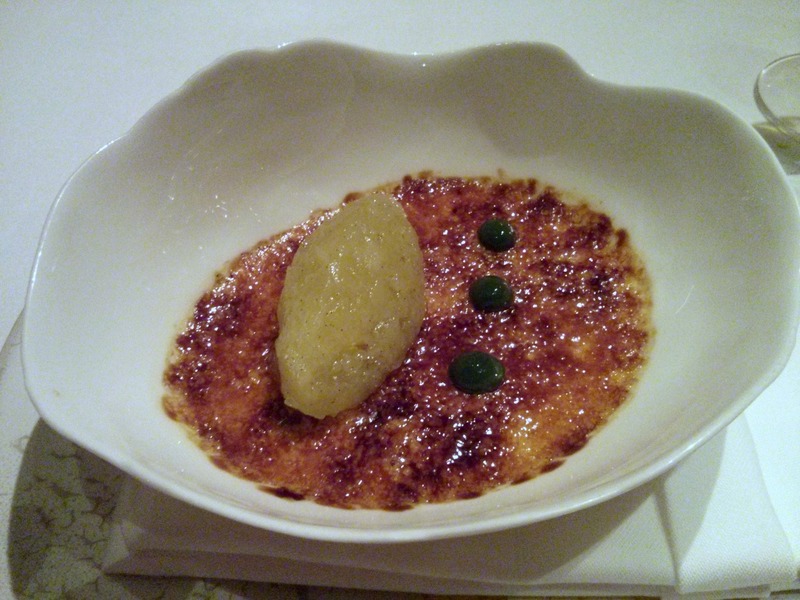 A citrus brulee was topped with a quenelle of apple and a lovage puree, a deceptively simple dish that worked really well, especially the citrus flavours in the brulee, which managed to be flavourful without being acidic. I'm a big fan of lovage too, an aromatic kick that blended with the sugary crisp and brulee so well. We finished with coffees and petit fours and left with the knowledge that this time, we certainly made the right choice on choosing the some of best food London has to offer. A perfect meal. 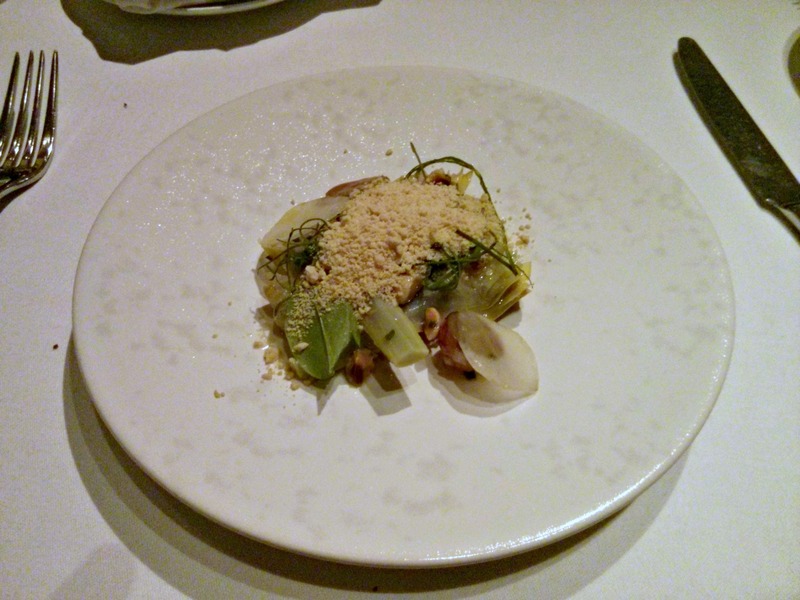 Salad of Violet and Chinese Artichokes with Hazelnuts, Grapes and Grated Foie Gras. 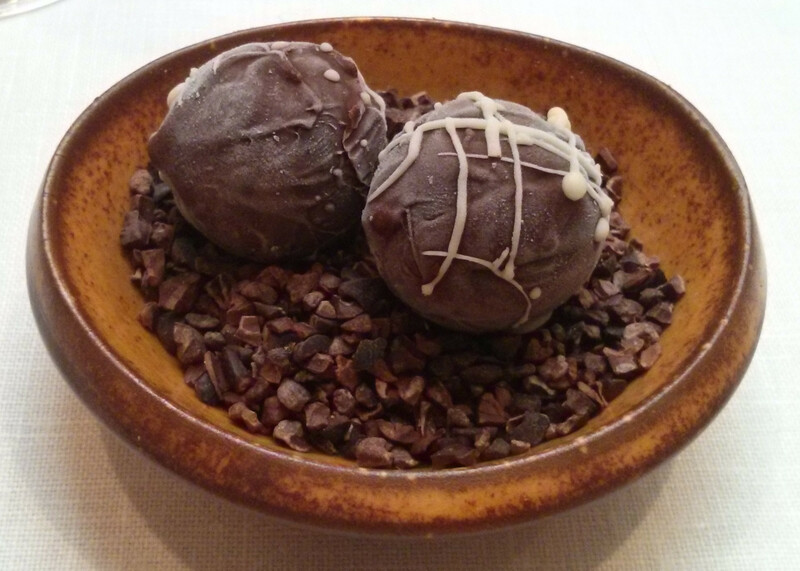 Crapaudine Beetroot Baked in Clay with Smoked Eel and Dried Olives. Hampshire Buffalo Milk Curd with Aged Comte, Truffle Toast and a Broth of Grilled Onions. Scallop with Seaweed and Cauliflower. 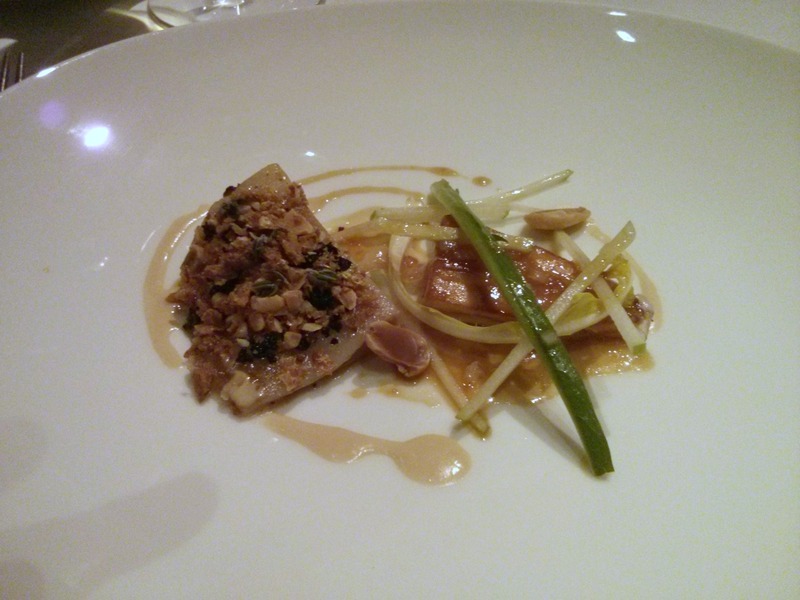 Jowl of Pork with Apple, Hazelnuts. Clove Yoghurt with Blood Orange Granita. Citrus Brulee with Apple and Lovage. Unfortunately two of my favourite restaurants have closed recently. 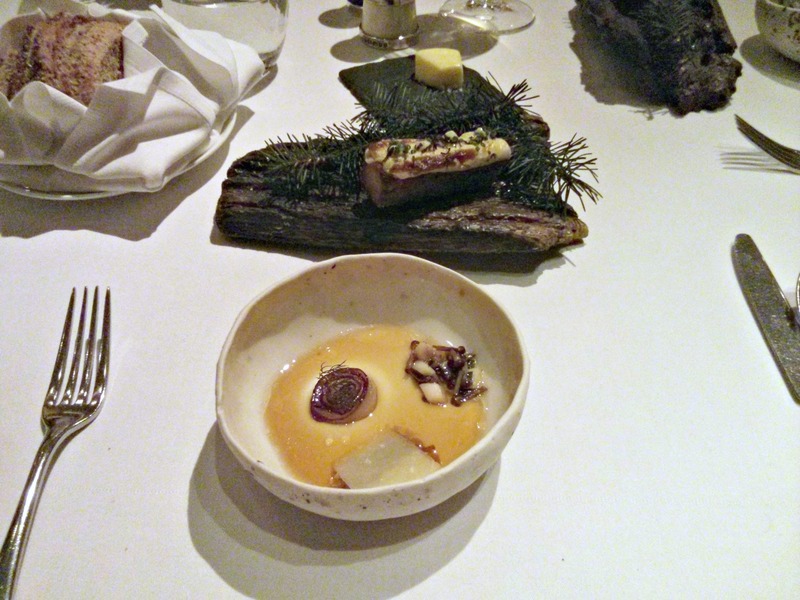 Nuno Mendes at Viajante left to start up Chiltern Firehouse, which is getting some good reviews and soon due a visit. The restaurant itself closed on 28th February, with Jason Athertons group looking to put in Lee Westcott from 22 Ships Ham & Sherry in Viajantes space. 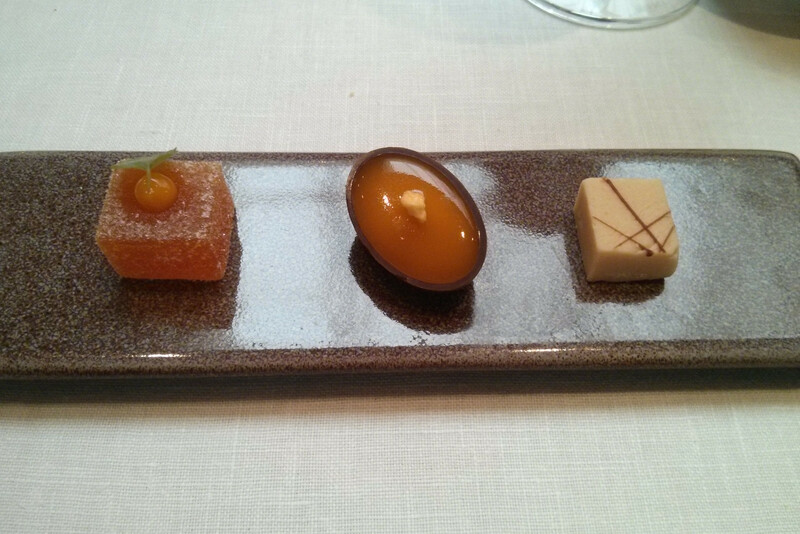 The second is Tom Aikens Restaurant, which closed last month. Tom is apparently looking to relocate to somewhere busier, either the West End or East End. I hope they hurry up, I really enjoyed our visits to his eponymous Chelsea restaurant. Also closed is Bo London, which looking back now, received a better write up than it should have done. These days, post HKK, I might have forgone the several hours of writing, formatting and photo editing and not bothered to write it up, much like disappointing meals at other places which never make it on to my blog. Whilst the food was excellent, the portions were tiny and the bill massive, and that's my main memory of it these days. Edit: Reports of Bo London's demise have been greatly exaggerated, apparently it's a refit not a closure. Edit 2: Actually, no, despite the statements that it was a water leak and refit, Bo London Ltd is in administration. Watch this space though, they might do the phoenix company thing and rise from the dead. 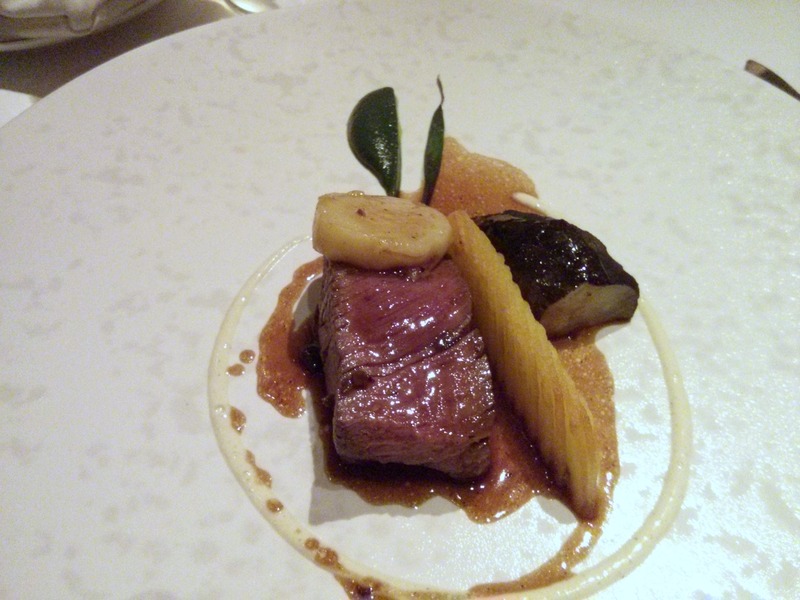 Since my previous post I had two more excellent meals with my wife, a fourth visit to Kitchen Table for their fabulous New Years Eve meal and a long lunch at Pied a Terre, who had an excellent 6 course tasting menu for £49 offer going that coincided with my wifes birthday. 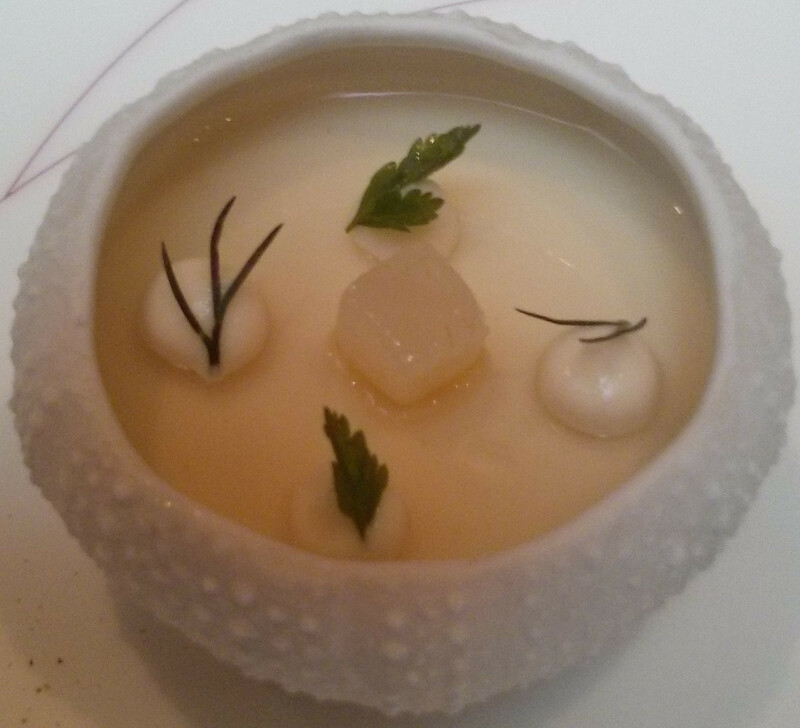 I've been meaning to go to Pied a Terre for a while, and enjoyed some fantastic dishes, a lovely gnocchi and chestnut truffle veloute starter, an excellent cod dish and guinea fowl main with some top rate patisserie on show with a chocolate dessert. On top of this was one of the best breads we've had in the form of a treacle loaf, and a very generous selection of petit four to finish, with some awesome cloud like doughnuts. 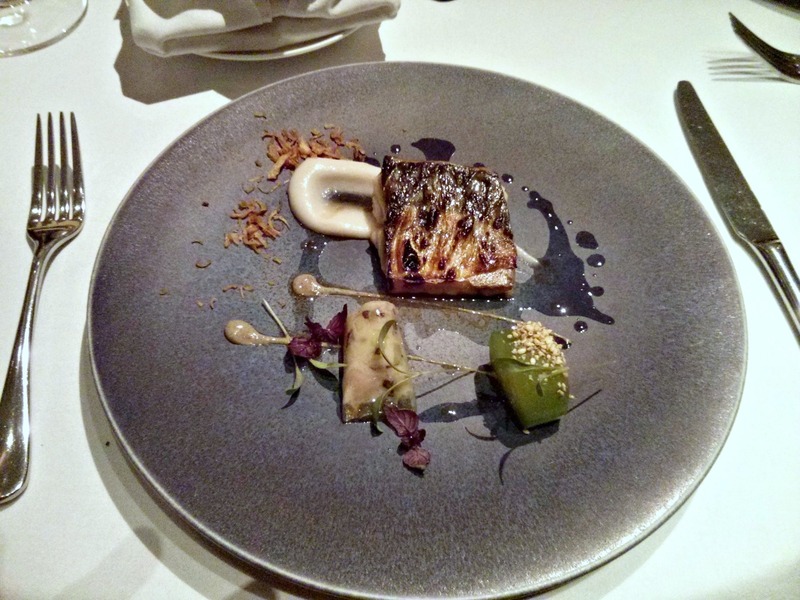 I also went to The Ledbury with my brother, in London on his annual trade show visit, and we indulged in the long tasting menu with a bottle of very good white and had a nigh on perfect meal. I'll write it up in detail soon. Lobster ready for plating at Kitchen Table.